Last Saturday (June 30), work had me travelling. An early departure time from Boston was required if I was to make it to the Kennebunk area of Maine for my business and back in time to work on a report I was writing for a client. 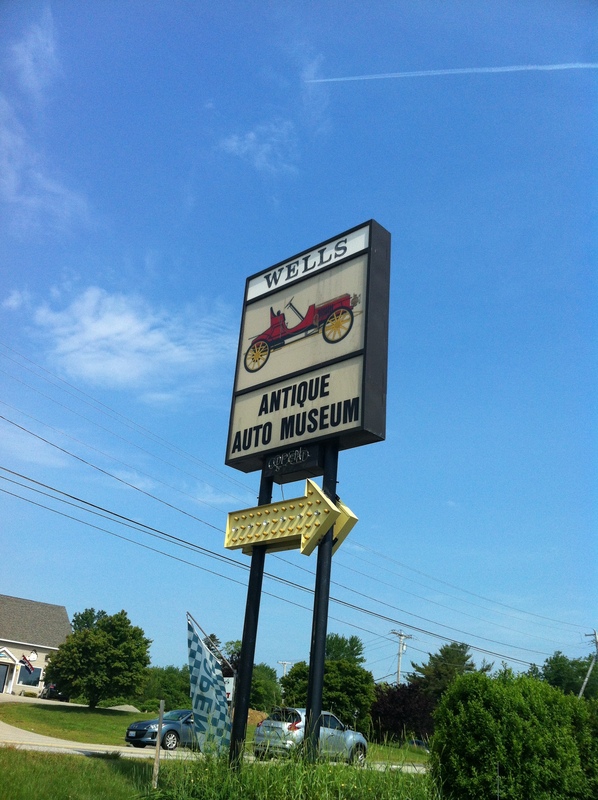 While heading to the Kennebunk area, I had the pleasure of stumbling upon the Wells Antique Auto Museum – just driving by it with no time to think about stopping in. My business in the area finished early, so I decided to turn back and check the museum out prior leaving town. The Museum looked closed and the parking lot was empty when I arrived. I decided to peek through the windows and see what was inside – I couldn’t see much. Sure enough, someone was inside and came to the door. “We will be opening up in 15 minutes, this is the first day we are open [this year]”. I figured that this was the right time to go grab some coffee. I returned a few minutes later to find the place had gained about a half dozen visitors. I decided to head in and check the place out and ask if they happen to have a spare three-brush powerhouse generator they would part with (you never know). They didn’t. I spent about 20 minutes around the car collection fighting my caffeinated brain’s consistent reminders of the 10+ hours of work I needed to do before Monday. Even with this distraction, I really liked the 1920 Templar Touring Car. My time to look at the cars was limited (that whole working weekend thing) but as I get talkative once I am caffeinated (COFFEEE GOOOD!!! ), I got talking to the two gentlemen running the museum (one named Len Parker and the other whose name currently eludes me. Regardless, I was told that the museum will be open this year only for the weekends of June 22/23, July 20/21 and August 17/18. They also told me that the museum’s collection was shrinking. By this time, there were a couple of dozen people in the museum. All had smiling faces. Some were drooling dangerously close to a beautiful 1924 Rolls Royce Silver Ghost. Then a few folks walk in wearing Seal Cove Auto Museum shirts. Let’s go back two years to the week after I purchased my Phaeton. At that time I found myself in Bar Harbor with time to explore. Seal Cove Auto Museum was one of the highlights from that trip – not to take away from cycling up Cadillac Mountain a few times and all the natural beauty of Acadia National Park. Seal Cove has “Tinkering Tuesdays” where crews of car guys focus their expertise on specific vehicles and fix/tune/maintain the cars. It was great. 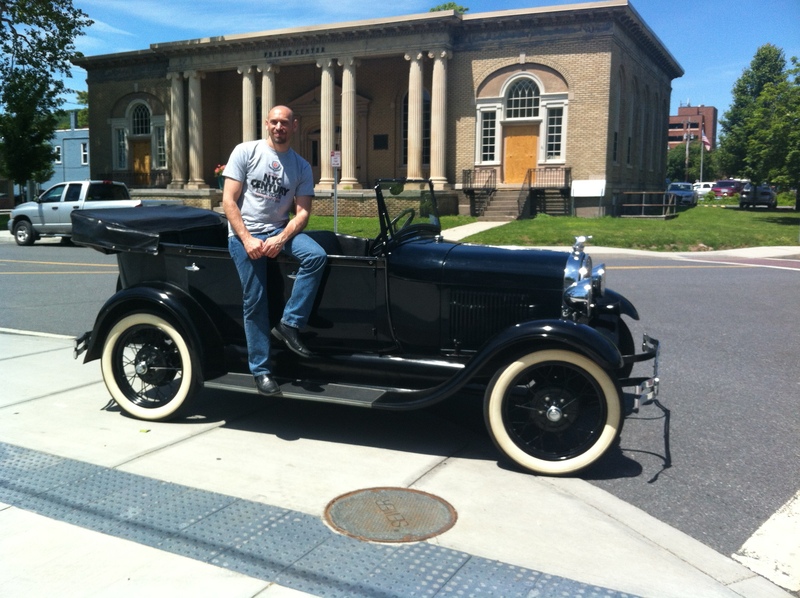 I had no car experience and a bunch of experts allowed me to help play with an old 1914 Ford that they were getting running. Back then, Seal Cove was looking for an executive director (or something like that) and I was not yet gainfully self-employed. I was tempted to apply but my “plans for the future” at that time wouldn’t accommodate a move to Maine. Ok, back to last Saturday. The folks that walked in included David White and Barbara Fox who sit on the Board of Directors of Seal Cover Auto Museum. I had to say hello to them as well (COFFEE STILL GOOOD!!!) and talk cars/museums. After we spoke, the crowd had again more than doubled. 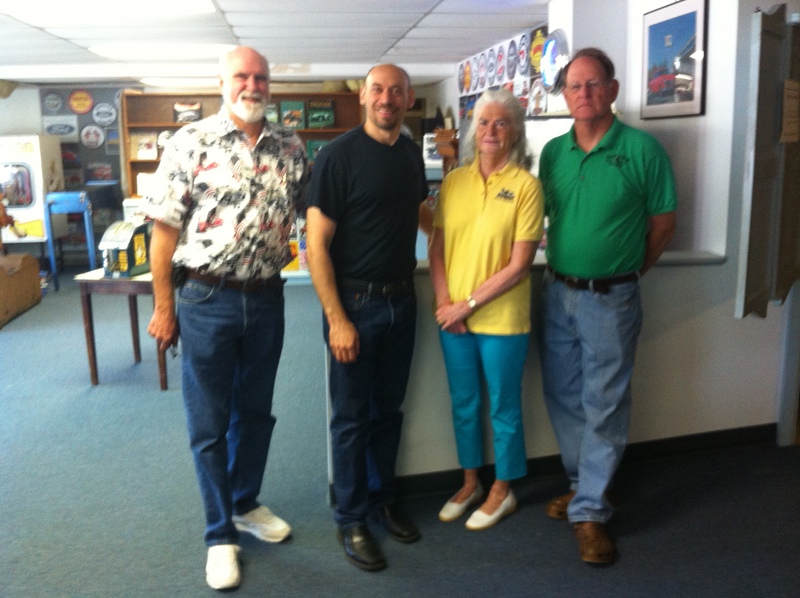 Wells Antique Auto Museum was filling up… and exponentially. By the time I made it into the parking lot to leave the crowed doubled YET AGAIN. The parking lot itself became a car museum. There were nearly 12 classics out in the lot including two cars being given the “once over” by even more guest. My coffee buzz was still going, but my 1.5 hour drive to Boston and backload of work needed to be addressed. 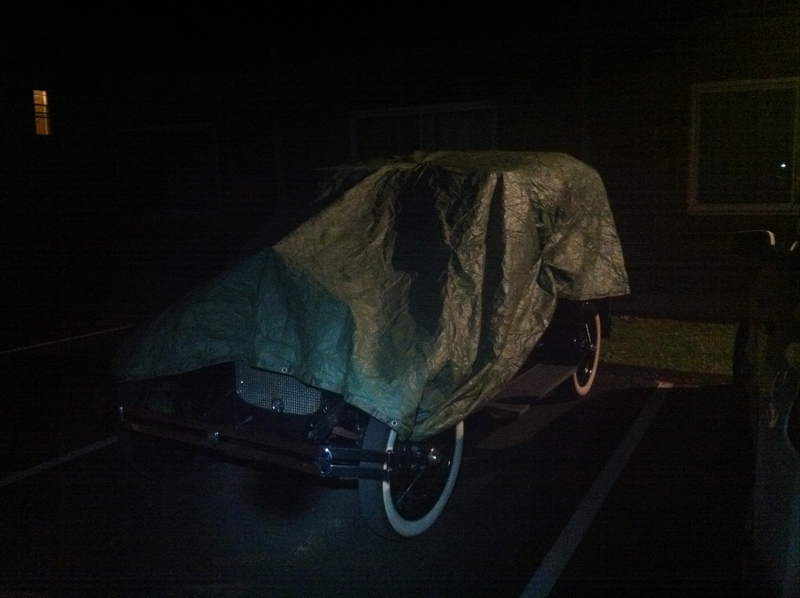 It would have been nice if my Phaeton could have joined for this trip… perhaps next time. If you haven’t checked out either of these museums, you should. Visiting Cornell for reunion and seeing friends and their families was a perfect recharge for my systems. It didn’t matter that it rained all Thursday, Friday, and most of Saturday. It was a great time regardless. I really do love Cornell and the people there. 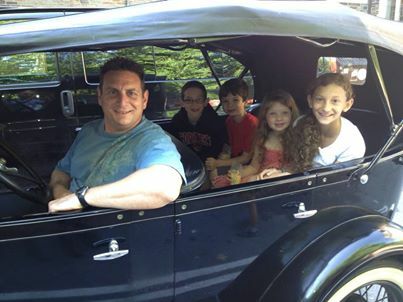 Here is Mark M in the driver’s seat with his kids in the back and joined by the R-F Family kids. 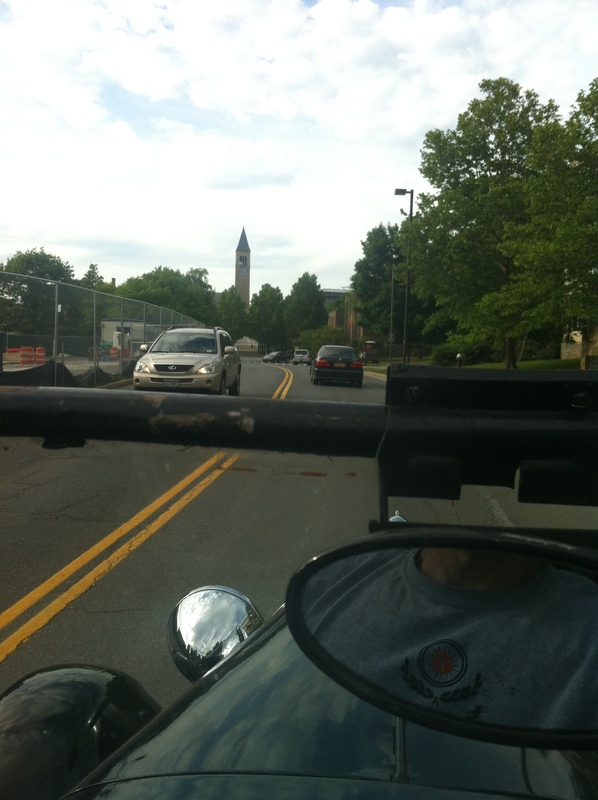 We had a great ride around campus, over two bridges, over speed bumps, and in the beautiful Ithaca weather. Next time perhaps Jessica M and Loren R-F will join. I love Cornell so much, just leaving campus to get groceries left me feeling a little flat, but not completely. I was able to get myself pumped back up. This particular tire tends to deflate on occasion. 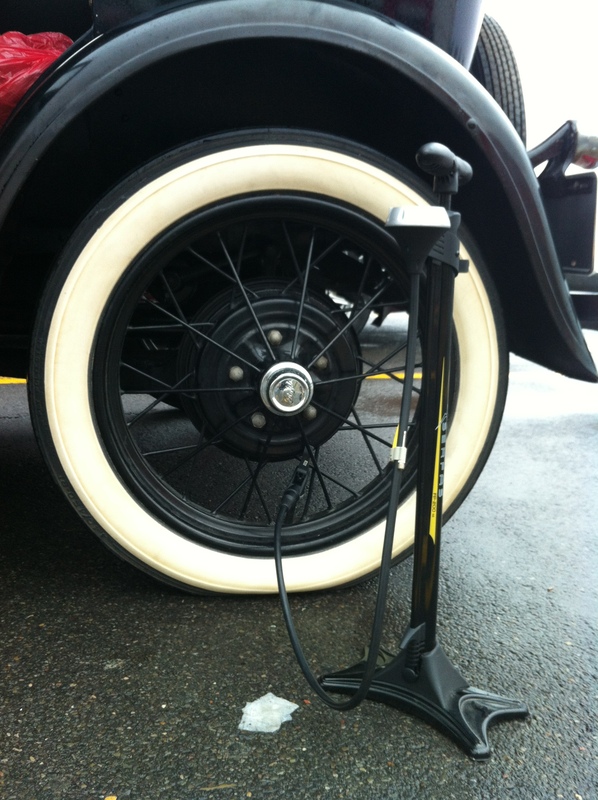 One of the highlights from the roadtrip was spending time with the guys from Sullivan Trail Model A’s. 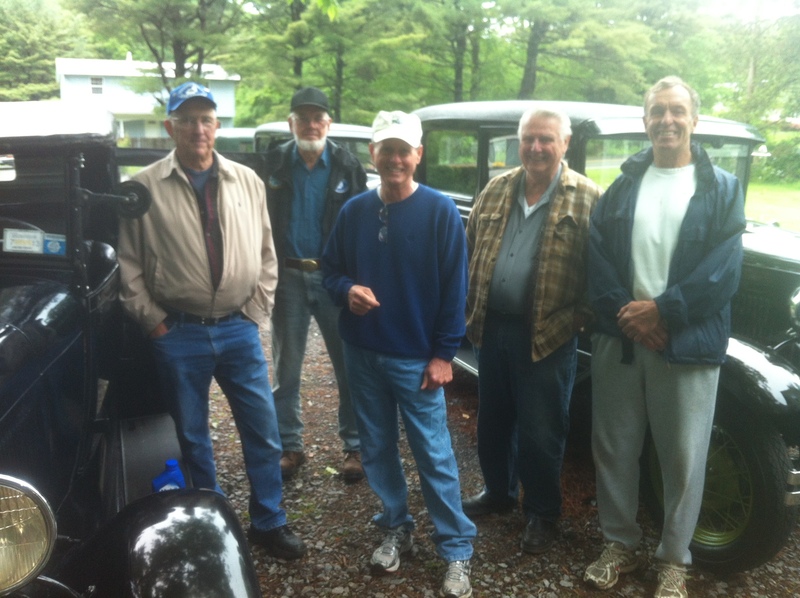 Jim, Bruce, Bill, Monty, Bob and I gathered over coffee, donuts, and cars early on Saturday morning. These “Gurus of A” were even kind enough to give my car a quick once over and share some thoughts/expertise. My “to do list” grew. 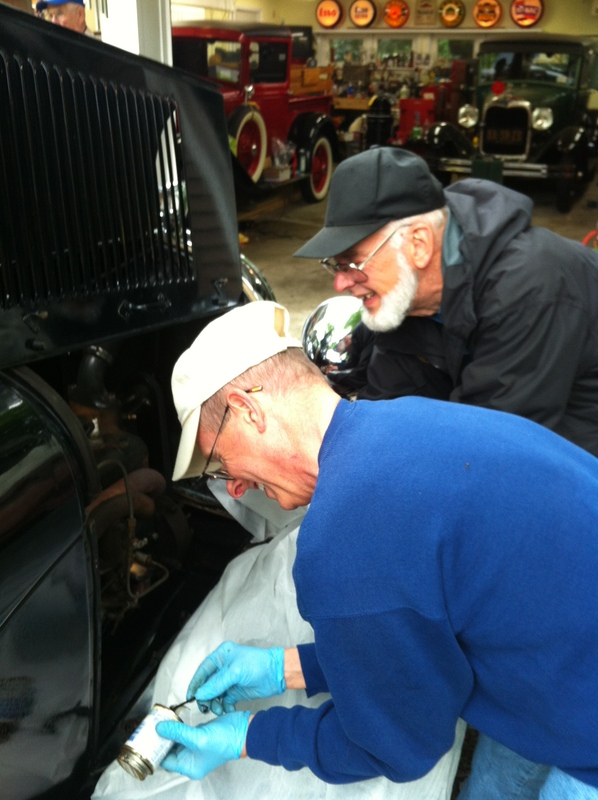 Here are Jim and Bruce trying to help me seal a leaking bolt in my valve cover chamber. I’ll be redoing the cover (yet again) sometime in the not too distance future – but not today. 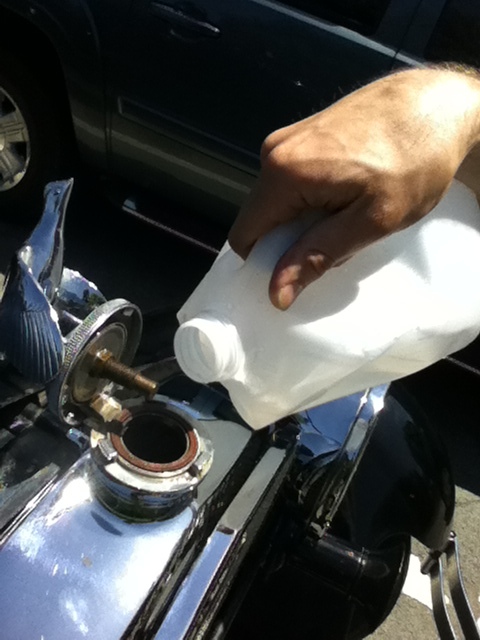 We also tighten my slightly loose carburetor. Regardless of having a few oil leaks and such, I decided to conquer Buffalo Street. Here is a video. Exit 77 on Route 17 is one of my car’s favorite places. 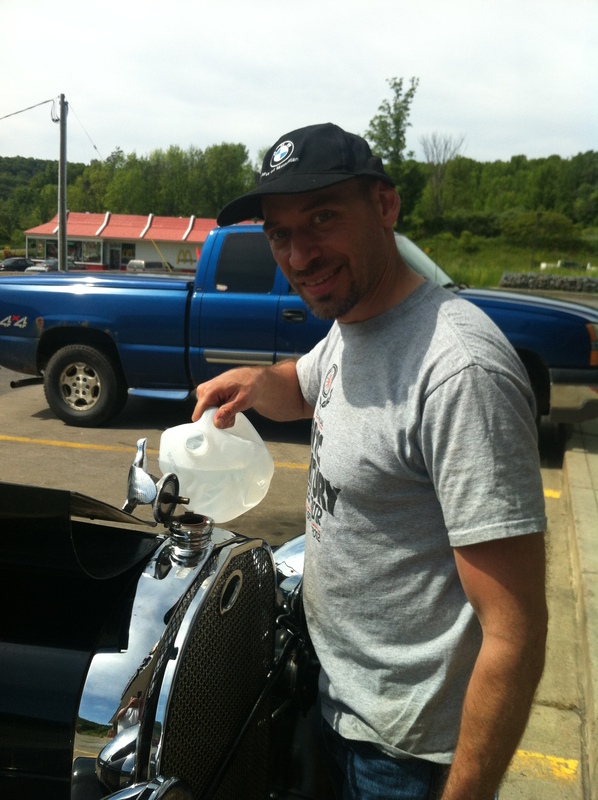 You remember where I stopped to fill with water when I was heading north? I was their again. Here is a video of me TRYING to fix a problem with the generator. The repair didn’t work. The insulation on the output bolt on the generator on my 5-Brush Powerhouse must have broken apart (it was OLD and fragile) and the output bolt was loose. I didn’t want to drive with the generator like this as I was afraid it would eventually fry itself. So, I took 20 minutes and swapped it out with my original 3-Brush Powerhouse. It worked just fine… even though its output was still higher than I like. I didn’t yet remove my “extension” of the wiring harness. Throughout the trip the car still was running a little hot and still was losing fluids (coolant and oil). I stopped every 40-60 miles to check and add fluids if needed. So, we made it there and back! This was the goal. Now have another long list of “to dos” that need to be done before the next long trip. The Phaeton continues to grow younger every trip. 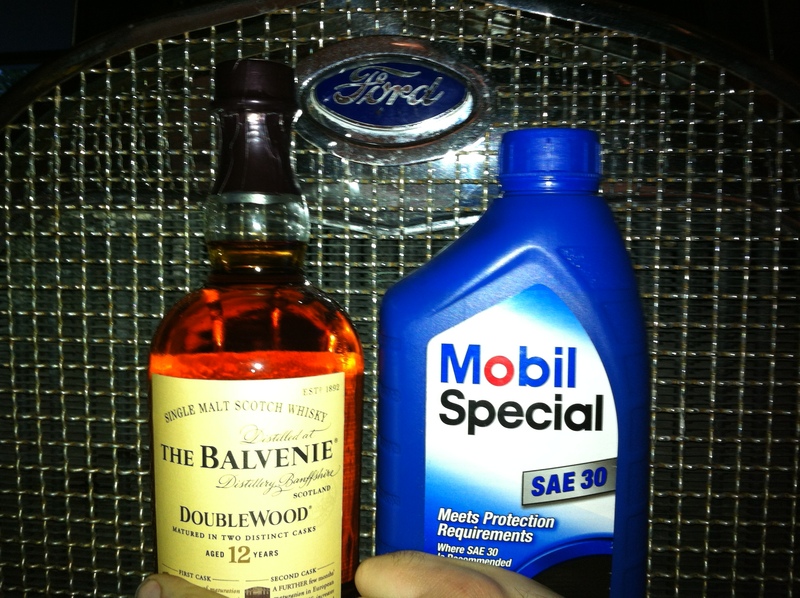 To celebrate, we both decided to have a drink….. similar selections, but different. What a trip! My Phaeton and I left the garage at 7:40AM. What is the first thing you do on a road trip? Fuel up… here I am at my favorite place to get my go-juice. 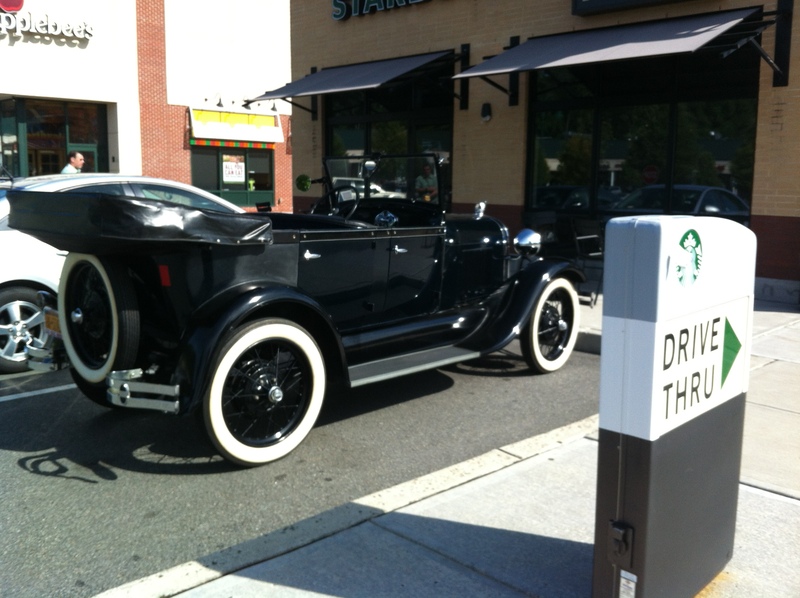 Actually, by 8:00AM the car’s tank was full and I was at Starbucks in Northvale NJ meeting with Rich Skriloff. Rich, as you may know from former postings, is a friend/business associate who has driven the car before. He and I spent a bit over an hour talking shop. Rich and I went to grad school together back in the late 90s. At 9:15 I was back on the road. I decided to take the I287 to I87 to Route 17 and avoid the big hill in Harriman. The car was a rockstar! The temperature remained low, the steering was tight, and the engine purred along. 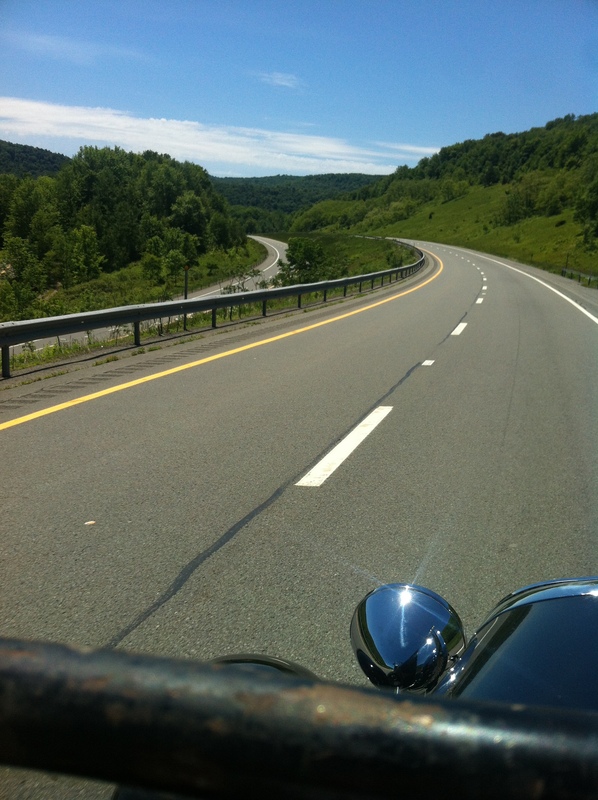 Here is a video of me on the thruway and another of me heading over the big Shawangunk Ridge. I made it to Ellenville. Here is a photo of me in front of the Hunt Building…. I almost owned this building years ago. I bet the city council wished they actually sold it to me now. In Ellenville I stopped in to spend time with Manuk and Joanie. I’ll try to upload the video of Manuk driving…. he was in love with the car. I suspect he is going to try to get me to tow him on his hang glider with the car and a long rope. It isn’t going to happen. 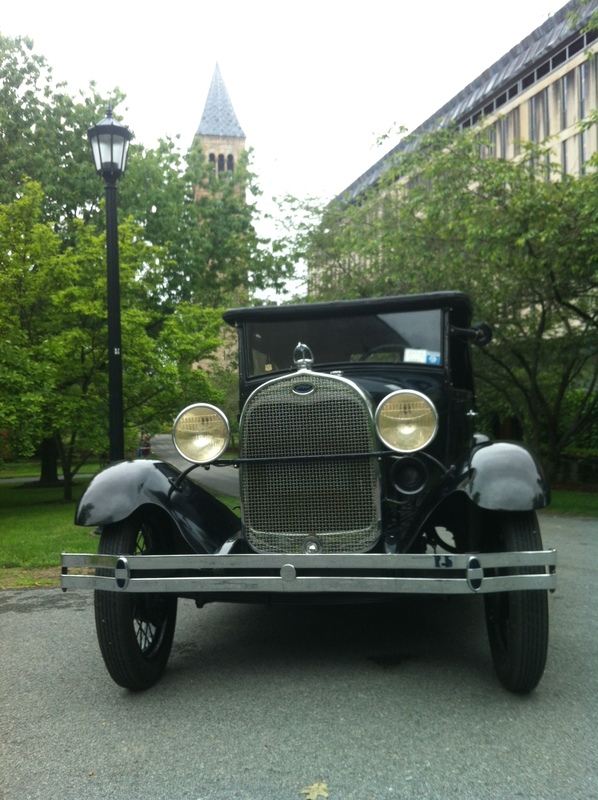 Why drive an old car all the way to Ithaca…. Just look at the scenery! Add water in Depot… and thank you to Mr. Donner(?) who saw me at the side of the road and INSISTED on driving behind me to the gas station to make certain I made it. I hope he and his daughter (or granddaughter) had a good day. 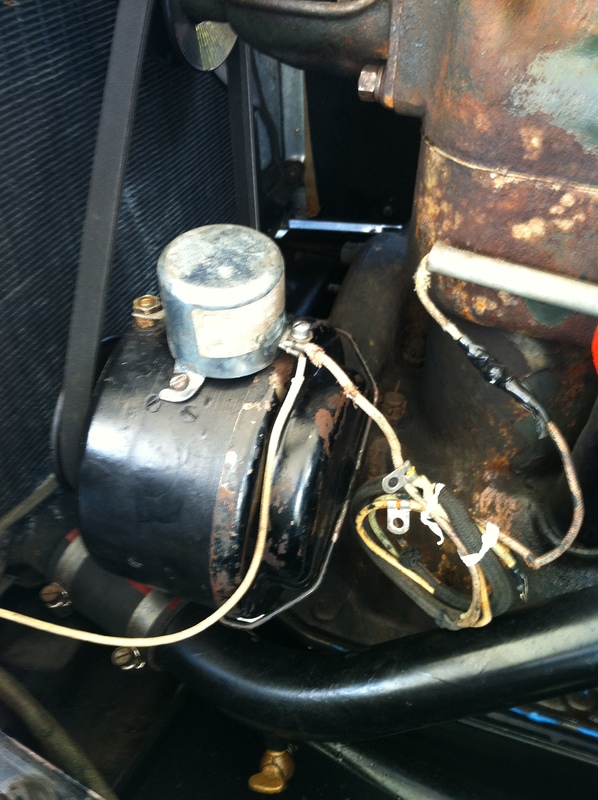 Oh, and the carburetor that leaked a little… it leaks a lot now. I’m going to have to deal with that soon. Why do I need to add water? It seems that SOMETIMES everything is ok and the car is doing find and then BAM it starts to heat up. I suspect I have some gunk in the radiator that is occasionally clogging a tube. My water pump’s impeller could also be overfilling the top of the radiator and causing the overflow to drain too much. Who knows. I also think I may be leaking/burning a little oil. It was LOW when I checked it a few times in route. I’ve added a bit of oil “just in case” each time with the knowledge that if I add too much the car will just leak it out as it finds its own level. Tomorrow I will have to look into this. With a recently run engine, the dipper doesn’t give a reliable reading. BINGHAMTON! I81 is the place to be. Let me tell you, the major roads were great! The only time I had a close call was when some IDIOT tried to pass me on a local road (NOT THE HIGHWAY>>>> THE LOCAL ROAD). The speed limit was 40, I was doing 43, they wanted to be doing 50. The guy tried passing in a no passing zone and then when the oncoming traffic prevented this, he started to push over and forced me to the shoulder. IDIOT! The highways were great. The drivers with all very respectful and friendly. The truckers love the Phaeton and I imagine I am on at least 100 different facebook pages based on the photos taken by random individuals. Cornell!!!!! I love this place. It only took 10 hours to get here…. ok, I stopped several times. It only took 7 hours to get here. I did take the long route. I have to check but suspect that with all my side trips I actually drove 260 miles. What do you get after you drive 260 miles? A beer! With rain expected for the next few days I’ve decided to put the top up, the side curtains on, and a tarp over the car. I’ve the good fortune of crashing over tonight at the AEPi fraternity house. 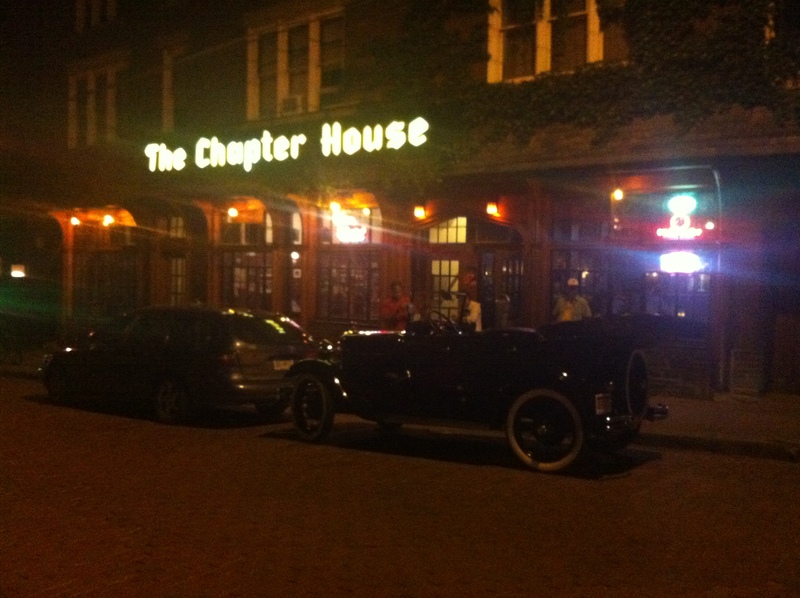 The AEPi house was my home for 3 years in college and a place I loved dearly. 20 years later the brothers handed me a key and the door codes and said, “come in and enjoy”. The car is going to hang out here for a few days as well. Saturday I am meeting up with the local model a crew at Jim Morris’s place (another true Model A guru) and on Sunday I am hoping to meet with the Binghamton crew.